Taking The Mother Road to Albuquerque to indulge in some Breaking Bad fandom before climbing around El Morro National Monument and standin’ on a corner in Winslow, AZ. Running alongside many stretches of the I-40, Route 66 has become a deserted road that can still take you across the country – if you’re willing to go 55 mph and drive in a single lane the whole time. Taking it on smaller stretches makes for a much more interesting and historic drive and also feels pretty cool following in the footsteps (or tire tracks) of so many folks in the past that had driven on it to get from LA to Chicago. 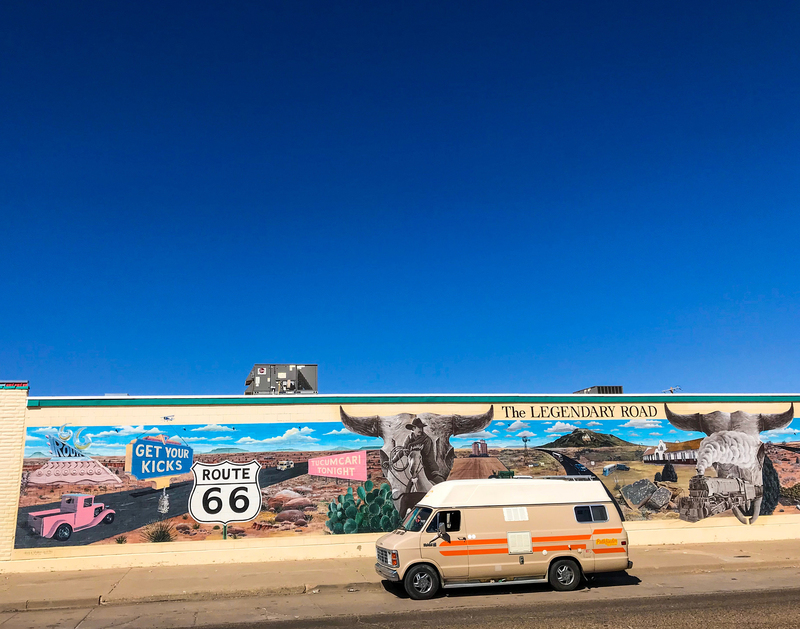 The 66 took us through Tucumcari for a look at a really rad mural commemorating the road and a chrome statue commissioned in 1997 that kind of reminded me of The Bean in Chicago. We try to at least get gas in some of these towns because despite having an attempted artistic revival, they’re mostly abandoned and very run down with the decline of Route 66 tourism. One strip of the eastbound road in Tijeras is called “The Musical Highway” with a rumble strip within the lane that when driven on at 45 mph, sounds like America the Beautiful is playing. Definitely worth the u-turn if you’re en route to Albuquerque or Santa Fe. Continuing along, we headed toward Albuquerque while I frantically googled which Breaking Bad spots along our route were actually worth stopping for. As I mentioned last time we were in New Mexico, the owners of Walt and Skyler’s house have put up a fence and seem to spend their days sitting in front of the garage warding off and yelling at tourists. Understandable? Sure. Comical? Very. I guess when that many pizzas have been thrown on your roof, you gotta do what you gotta do. Why they don’t just move is beyond me but we decided it probably wasn’t worth the stop. Los Pollos Hermanos, as most people will point out, is actually just a fast food chain called Twisters that still has the mural inside but just didn’t feel the same. In any case, my two priorities were getting some blue meth candy at The Candy Lady in Old Town and seeing Walter White’s headstone in the random strip mall that it dwells in. The Candy Lady’s “crystal meth” is the actual blue candy that they used on the show in the first two seasons made by the local Albuquerque candy shop. Stopping in just for “meth,” I ended up leaving with some delicious red chili chocolate and a vanity plate for the front of the van since New Mexico has the coolest license plates. The drive through Albuquerque from the eastern side of town was definitely not the nicest but the Old Town had similar charm to La Mesilla of Las Cruces before opening up to the more countryside looking neighbourhoods of the north. 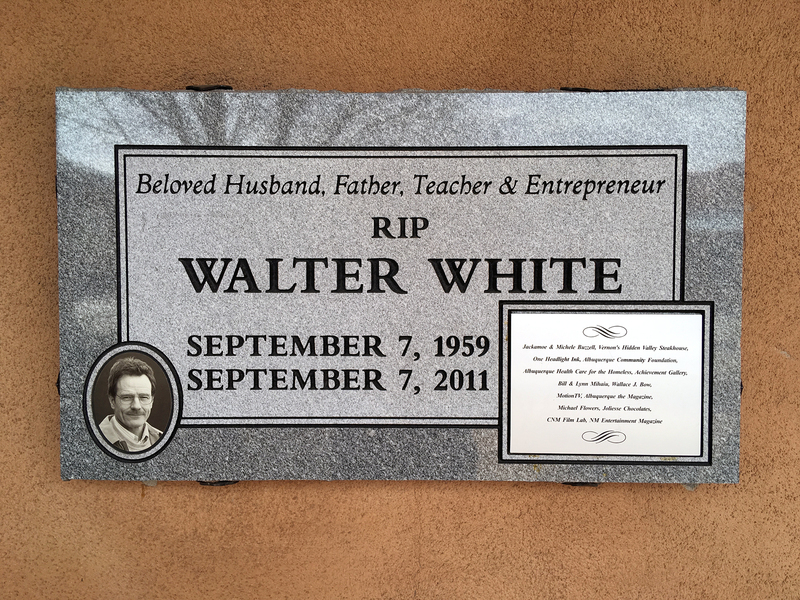 Finding Walter White’s headstone gave some strange directions but eventually made sense after reading that it was originally in a cemetery but the relatives of the actual dead people found it offensive so had it moved to the plaza where most of the funding came from. Once you find its discreet location, you see that it’s a legitimate headstone. If you didn’t know better, you’d think someone was actually buried beneath the walkway of this random strip mall. Justin never watched the show so I paid my respects and we headed on. Usually camping within a National Park or Monument is for a fee and requires a reservation but thanks to some friends we made in Mexico, we learned that at El Morro, it’s free! In fact, in 2013, they made entrance to the campground and the monument itself completely free to encourage people to visit, I’d assume. We arrived in the evening and camped the night before exploring the actual park the next day. We opted for the 3km hike to the summit and back down to see the relics of the pueblos that archaeologists uncovered in more recent years. Passing through Inscription Rock, there are etchings and carvings left by all the people that passed through here in the 16 and 1800s. This was a hotspot for nomads wanting to reach California or the Colorado River because there is an oasis of clean drinking water that flows year round in the middle of the desert. Some of the inscriptions were absolutely insane – as design nerds, we couldn’t believe how precise and elegant much of the signatures were considering they had to be chipped away with rocks or other tools. 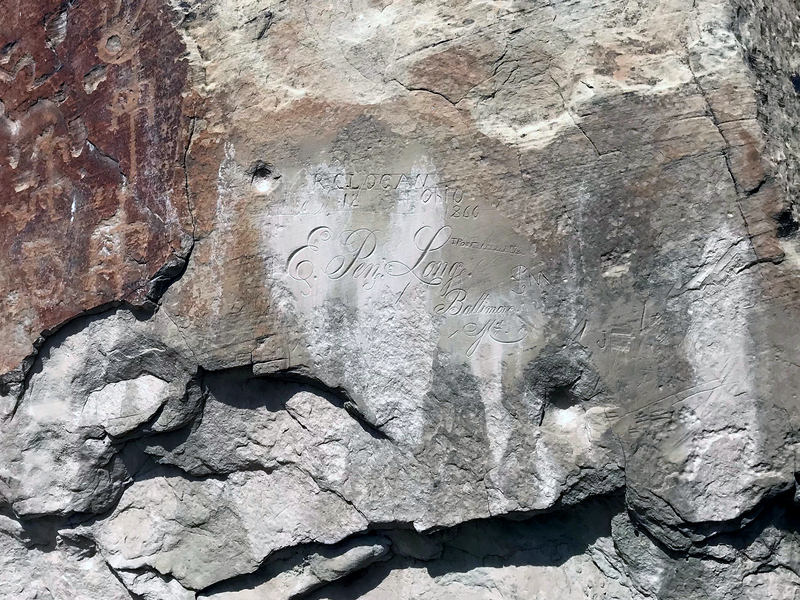 Over the years, people essentially wrote “[insert Spanish conqueror’s name] was here” all along this rock until the Parks service decided to close it off in 1905 to preserve the historic inscriptions and petroglyphs and prevent modern day trolls from leaving their mark. Reaching the top made for some stunning panoramic views of the area and the canyon within it. One of the coolest parts was seeing the pueblo where the Zuni people lived in over 800 different rooms atop El Morro in the interest of protecting their resources. Archaeologists have uncovered about 30 different rooms but decided to leave the rest uncovered in order to not subject the materials to further weathering. To think that thousands of people used to live in these tiny stone rooms was pretty crazy but also very impressive considering what kind of tools and materials they had to work with. 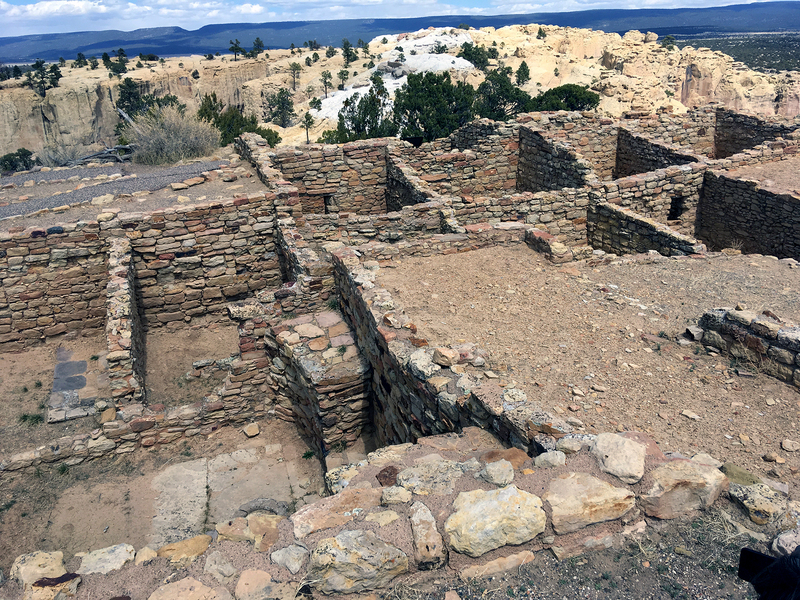 After parting ways with El Morro, we drove through the town of Zuni where the modern generations of the people that once lived there now reside. Zuni Pueblos – those bedrooms are van sized! And just like that, we were back in Arizona. Arizona’s been one of our favourite states so we were stoked to be back. 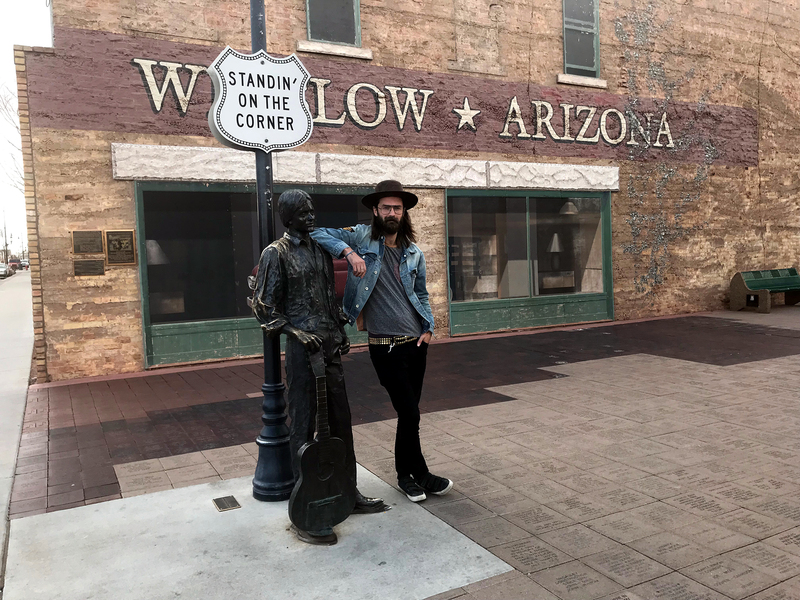 The fist order of business was stopping in Winslow so Justin could fulfill his Standin’ on the Corner dream. He was clearly not the only one on this pilgrimage as there’s a statue, mural and a bunch of Eagles-themed shops and merch all around. There were many other people there to have their picture taken and relish in all the musical glory. Luckily, there is a park just south of Winslow that you can camp at with a view of a river and the surrounding farmland. 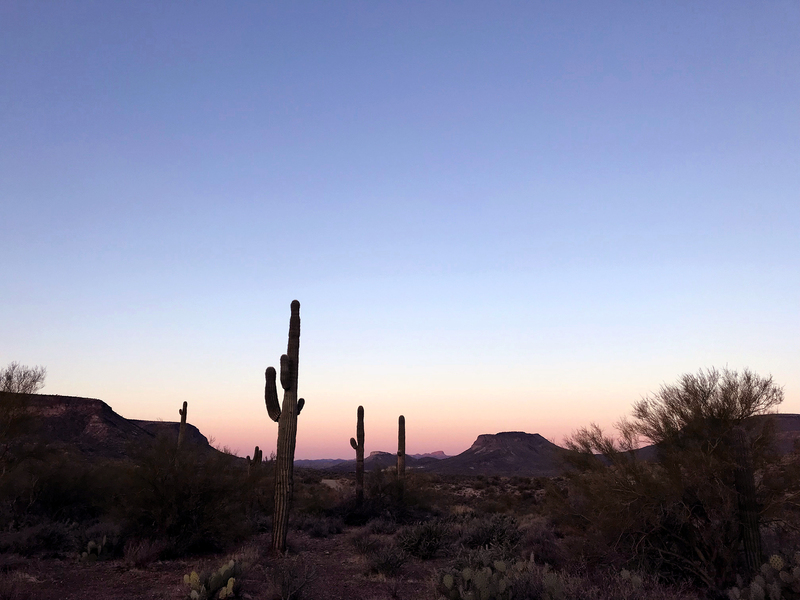 Unluckily, it got uncomfortably cold at night so we kept on truckin’ in search of the warmer temperatures that Southern Arizona has gifted us with before. Driving through the Coconino National Forest is so glorious and diverse with the severe elevation changes that make it go from desert to boreal forest real fast. With the mountain driving, Clementine started making that pinging sound again and didn’t seem to be too happy with all the steep grades. We knew the octane booster was just a temporary solution and we’d need to revisit the situation again soon but knowing something was up was definitely stressing us out. We needed somewhere to crash for the night so we headed toward New River and set up shop at a super cool BLM surrounded by wild burros and Saguaro cactuses. After working the day away, we closed in on Phoenix and got ourselves some overdue showers and stocked back up on groceries. 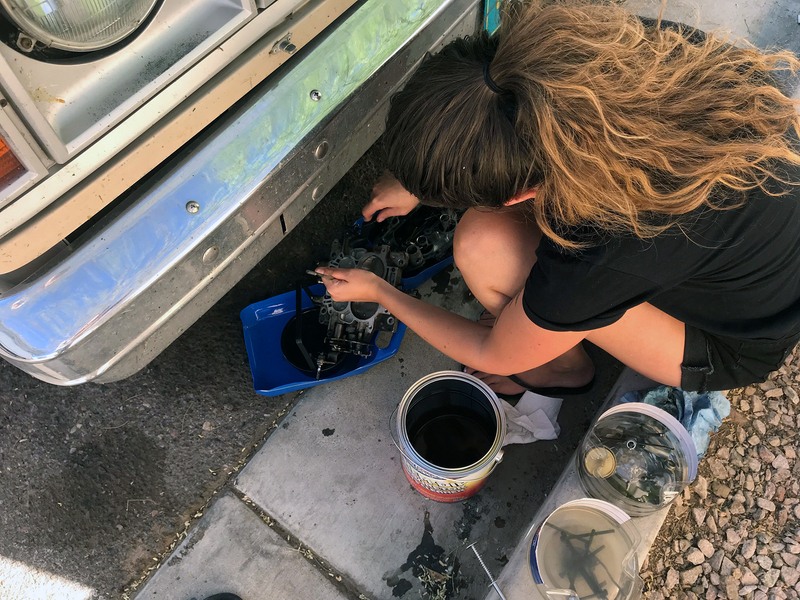 We settled at a Walmart just outside of the city in Buckeye and got down to business troubleshooting what could be wrong with the van. My only idea was that the EGR valve needed to be replaced, which would be pretty straightforward and would set us back a mere 25 bucks. 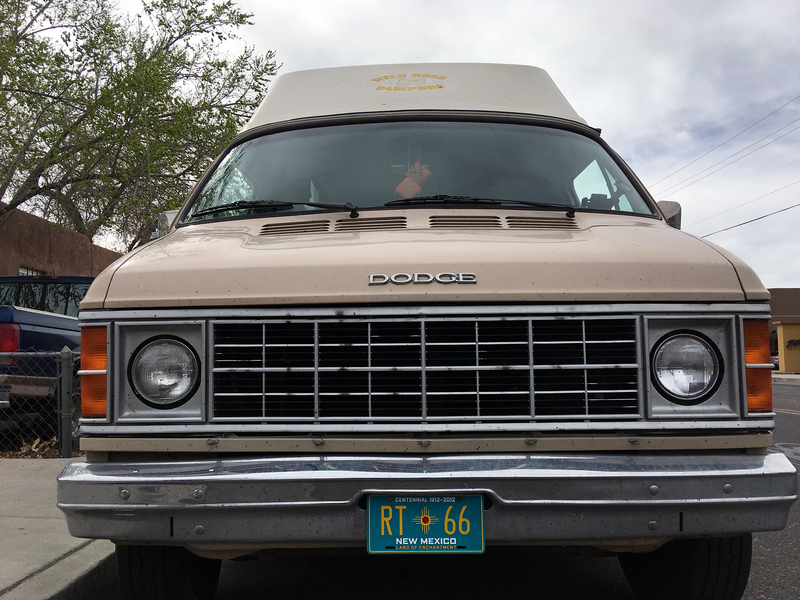 Long story short, we popped into an O’Reilly and had a chat with the admirably knowledgeable and friendly staff to conclude that the EGR was fine we were at the beginning of having some carburetor problems. The manager/our new best friend said he was confident that we could rebuild it ourselves since it’s meticulous but not overly difficult. Within the hour, we had a carburetor rebuild kit on order and were shitting our pants a little. We slept at the store and spent the next day carefully labeling and cleaning every piece while photographing our every move. All in all, it had its challenges but it really wasn’t all that scary. My obsessive-compulsive tendencies majorly came in handy in staying organized and keeping foolproof notes of the disassembly in order to zoom through the rebuild. 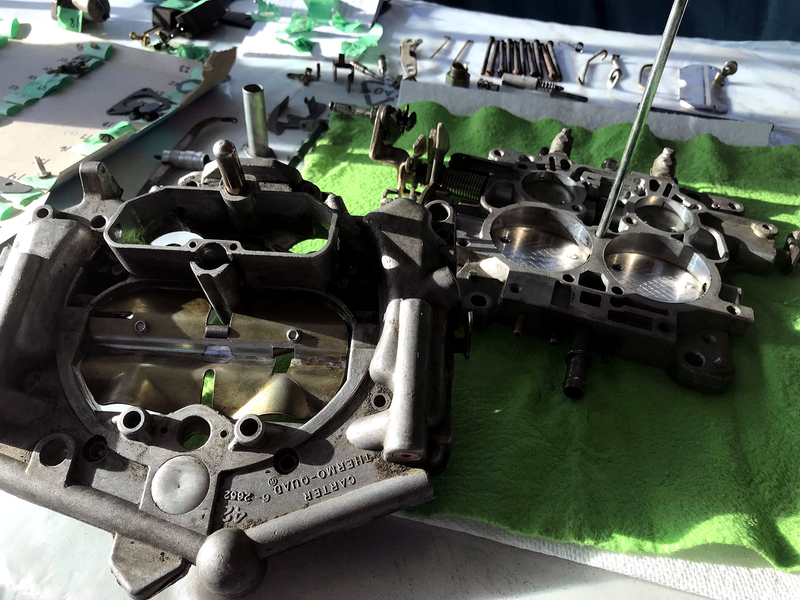 …and is now a clean happy carb! 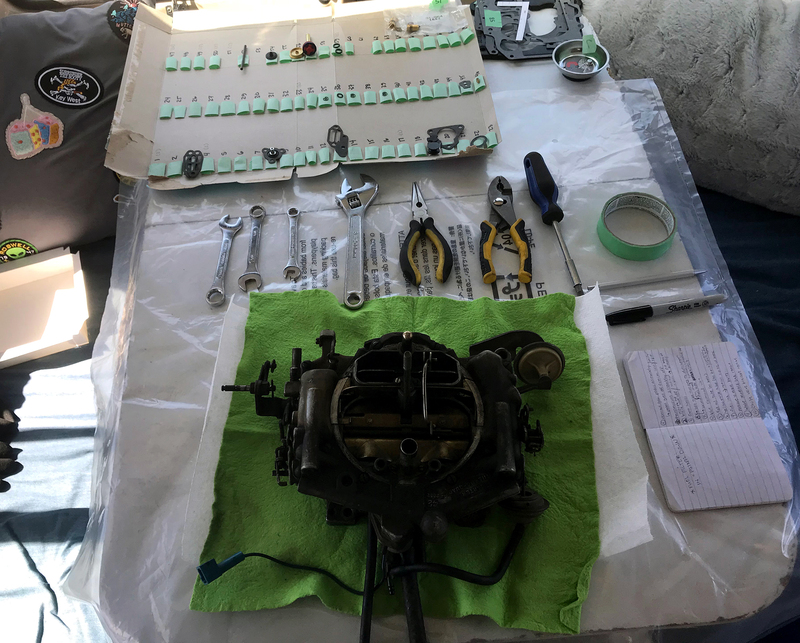 While we were getting down and dirty into the mechanical grease, we upgraded a few other parts and prepared ourselves for the carb tuning process. I personally find this the most challenging part because it can be so finicky but it’s all part of getting Clementine driving back to the way she should be. Doing this all ourselves kept our costs down immensely (the carb rebuild kit was $43 while a new carburetor is $400+) so we treated ourselves to a mini projector! We had contemplated getting a small TV to not have to hold a hot laptop while watching a bedtime movie but it just seemed like it’d be awkward and bulky in our small space. We ended up finding this teeny-weeny pico projector at Walmart for 100 bucks and grabbed a pull-down blind from Lowe’s for a whopping $7 and just like that, had a sweet little theatre setup! This is a pretty no frills projector but we didn’t need all that built-in Smart TV stuff since we’re rarely on wifi. 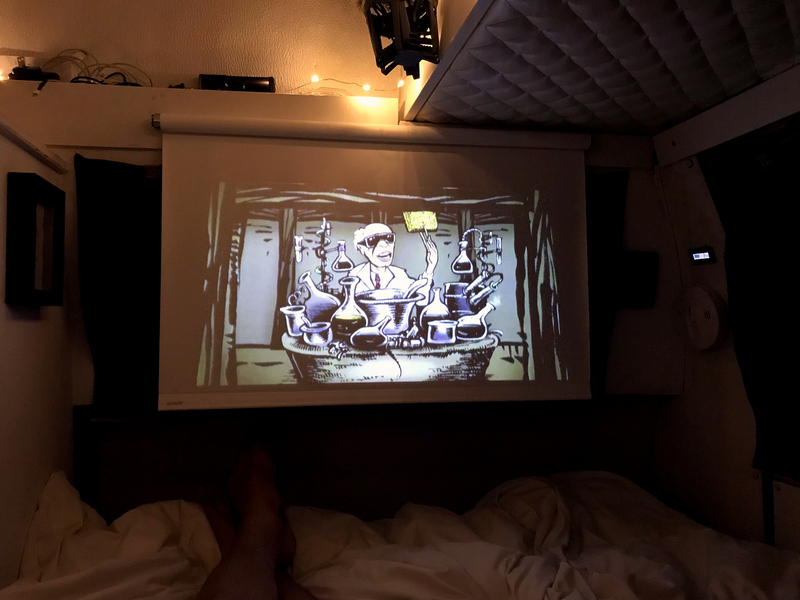 It suits our needs way better than a TV would and we can even take it outside to project movies onto the side of the van. For any vanners looking to upgrade their screen situation, we 100% recommend a pico projector (no, we don’t have shares in the company…). The van is now a theatre! It’s finally California time and we’re stoked for this milestone of our journey. We will now have officially hit the Atlantic and Pacific Oceans (and can’t forget about that Third Coast) and are on our voyage back to the Great White North. We’ve only scratched the surface on all the places we could explore in America but we’re totally on board to spend next winter out of the cold again. For now, we’re stocking up on gas, propane and pretty much everything else in Quartzsite before enduring the Canada-like prices that California is so known for.